Yesterday I went to the studio to work on this project, a heart-shaped box that I am covering with collage and decoupage made from printed metallic ribbons. Last night I posted a photo to show yesterday's progress. This photo, a closer look, shows more detail. I have been working on the gold area around the edge of the box. This morning I had to get my car inspected, a yearly chore that is usually quite a nuisance. But this time, I had the inspection done at a garage around the corner from Red Brick, so instead of waiting around for my car, I walked over to my studio and spent about an hour working on this project. 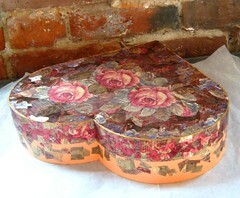 I am covering a heart-shaped cardboard box with collage and decoupage patterns created from printed metallic ribbons. I received the box several years ago; it held a Mother's Day present from my daughter. I have been working on the gold area around the side of the box, at the bottom. I am beginning to fill in the bottom edge. I had a good time, and it would have been alright with me if the car inspection had taken even longer! Tonight was the last class of the basic drawing class I have been teaching at Red Brick. 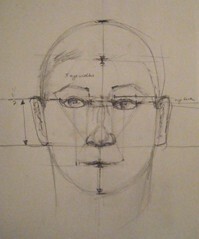 Last week, I did a quick sketch to demonstrate how to start a drawing by laying out the proportions of the face. (I posted that sketch here on July 22.) In tonight's class, I went back to the original sketch ("before") and demonstrated how to correct proportions by checking and measuring with a ruler. This sketch is "after". I corrected the placement of the eye line, which was too low. That change made the face longer and the hairline higher. 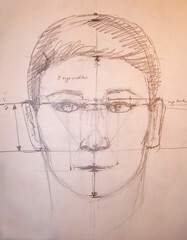 Then I lowered the eyebrows a bit, and added cheekbones to refine the shape of the face. I took a quick picture to keep this image. When I got home tonight, I realized that there were some cast shadows on the edges of the drawing, so before I posting, I opened the image in Painter IX and cleaned up the shadows with some digital pastel. Yesterday, I came across some misplaced artwork while I was cleaning the house, drawings and paintings stashed in a bag that I thought held art supplies for the studio. 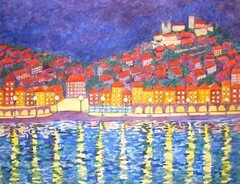 This painting was among them, a watercolor of Portugal, a night view of the river in Porto. One source for this painting was a rough digital sketch on my PDA (handheld computer) that I drew in Portugal during a visit several years ago. I had recently seen the river at night on a drive through Porto, so I was working from recent memory, rather than observation. I was surprised by how well the little digital sketch turned out, so when I got home, I cleaned it up and posted it here. (The title is also O Ribeiro em Porto, posted January 8, 2005.) But I also have painted a series of watercolors of Portugal, and I began this watercolor soon afterwards because I wanted to paint this view in a similar style. I used photos I had taken during the day, as well as what I knew and had seen of Porto and the Douro River to supplement the information in my sketch. This watercolor is the result. When I was painting this, I was happy with it, but didn't think it was as strong as that PDA sketch. (I still think that is true.) However, when I found this watercolor yesterday, I was ready to see on its own terms, and like it much better. 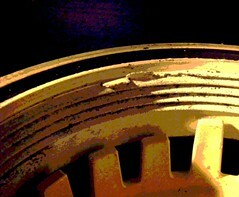 Of course, it also brought back great memories of my visits to Portugal, so I was very glad to see this lost souvenir. Today I was cleaning up around the house and decided to go through a large bag that had been hiding in a corner of room. I thought it contained art supplies for the studio. Well, there were some drawing pads in there, but I was happy to find some of my art work in there as well: some watercolors (some complete and some not), oil pastel figure drawings, and some full-size color photocopies of my pastels and watercolors. I had the copies made professionally a few years ago before showing the work. (Now I rely much more on digital images). Today I was glad to see those color copies, because I had sold or given away some of the originals, and had no other images of them. 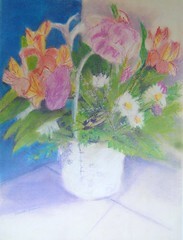 The still life posted here is one of the pastels, done several years ago when I was part of a drawing group. Some friends from the drawing group now own this pastel. But I am glad to have the color copy because the composition is unusual, and the lines of the drawing are very relaxed, something that I like to achieve but seldom do. Well, after going the bag of my art work that had been stashed in the corner, I decided to make sure I have digital photos of everything, including those color photocopies, loaded into into the right file in the computer. (While I am at it, I will post some of it here.) Then I will take the art work to the studio, put the finished things in my portfolio, and work on the unfinished pieces as I get a chance. 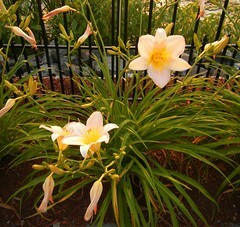 Here is my third photo of lilies in front of an iron fence. I took it last weekend during an evening walk at the Cummings Center here in Beverly. I took three similar photos of these lilies, and decided to post all three photos. (Versions 1 and 2 were posted yesterday and the day before.) But to be precise, this is actually version 3.5 because tonight I re-edited this photo, cropping it for symmetry. This resulted in a different format and a slightly closer look at the lilies. At this point, I think this might be the best of the three photos in terms of the composition, and the light. I was interested in the slightly orange cast of the evening light playing on the flowers, foliage, and ground. 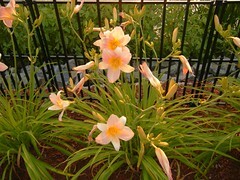 Last weekend, during an evening walk at the Cummings Center Pond, I took some photos of daylilies blooming in front of an iron fence. I liked the lilies in the evening light, and the contrast of the flowers with the geometry of the fence. I edited the photos yesterday, and realized that I had three photos of the same subject matter. I couldn't decide which one I liked best, so am posting all three. This is the second photo. One of the things I like about this version is that it shows a little bit of the design at the top of the fence. There's one more, for tomorrow. . . .
Last week we had a heat wave, and when it gets really hot, one of the few places to walk a dog in relative comfort is the pond at the Cummings Center. (Here in Beverly, dogs are not allowed on the beach between Memorial Day and Labor Day.) This photo was taken on an evening walk last weekend, around seven P.M. There are several gardens planted here and there around the pond. 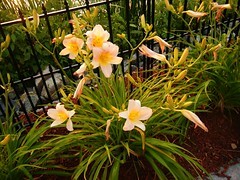 Right now, the daylilies are blooming, and I was admiring them in the evening light. I loved the contrast of the flowers with the wrought iron fence behind them, so I took some pictures. Tonight as I edited the photos, I found that I have three very similar photos. I like all three, and couldn't decide on a favorite, so I will post all of them over the next few days, one each day. Here is the first one. Now that the weather has cooled off a bit, I was able to get up to the studio this morning and work on this project for an hour or so. I have a heart-shaped cardboard box that originally contained a Mother's Day gift from my daughter. Now I am making it into a keepsake box and covering it with collage and decoupage designs made of printed metallic ribbon in a variety of patterns. Today I concentrated on the gold pattern on the sides of the box, shown in a closeup view here. I am happy with how it is going, but I am beginning to worry about having enough gold ribbon. . . . This is a quick sketch that I did tonight in the basic drawing class that I am teaching at Red Brick. I was trying to demonstrate basic (average) facial proportions and placement of facial features, which is why there are arrows, marks, and other annotations on the drawing. I liked the way the marks looked on the drawing, so I took a photo. This is a very rough sketch, and I labeled it a work in progress, because I might develop this drawing a bit more to show the students. To be continued. . . . 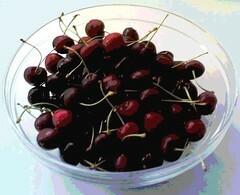 Here are many, many bowls of cherries, ready for a celebration in July! This morning I made this pattern in Painter from the image I posted yesterday: a photo (posterized) of cherries in July. 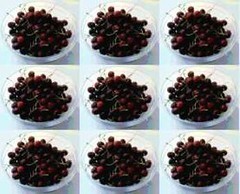 The little song about cherries is a reminder to relax and enjoy life: "Life is just a bowl of cherries, so live and laugh at it all!" Tonight I created this digitally manipulated version of a photo that I took and posted here back in July of 2005. I came across the original photo tonight and thought it would look good posterized, so I opened it in Painter IX and tried it. I liked the result. So while I was at it, I used Painter's magic wand tool and added some light blue color overlay to the background. Well, as time goes by, I guess some things don't change that much: every summer I look forward to bing cherries, I always enjoy eating cherries on a hot July day, and I am apparently incapable of looking at this image without hearing a little soundtrack in my head ("Life is Just a Bowl of Cherries"). I took this photograph on Thursday morning, from the 6:55 AM train back to Boston. You actually can't see much of New York City from the train because travel in and out of the city involves going through a tunnel under the river, and directly to or from Penn Station. But you can catch a glimpse of the Manhattan skyline as the train travels through Queens, but you have to wait for just the right angle. That is what I did on Thursday morning, and I had pretty good luck this time. I used the zoom on my new digital camera. This is one of the best of the photos I took and today I cropped it to get this composition. I also adjusted the brightness and contrast to compensate for the tinted windows of the Amtrak train. The morning light was beautiful and I wanted to make sure that came through in this photo. 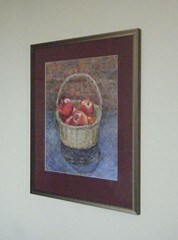 This is an oil pastel drawing that I did back in September of 2006, and posted here daily as the drawing progressed. When I found out that my aunt admired this drawing, I decided to give it to her, so on one of my trips down to New York City, I took it along on the train (unframed) in a portfolio. Yesterday I visited my aunt and saw this drawing matted and framed for the first time. My aunt picked out the color of the mat and I think she did a great job! I took this photo yesterday in New York City; tonight I opened the image in Painter IX and used a little digital chalk to tone down some reflections visible in the glass. 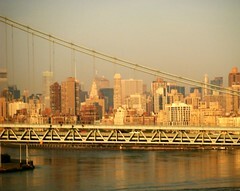 I took the train down to New York yesterday to spend the day visiting family. It was a short visit, but we made the best of the time we had. At lunchtime, we took a walk down Broadway. 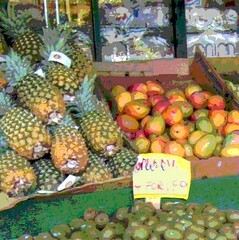 We passed this fruit stand on the corner. I love the outdoor grocery displays in New York City, so I took a couple of pictures. Tonight I cropped the image to focus on the pineapple, mango, and kiwi fruit displays (which seems appropriate, given the tropical weather in New York City yesterday). I also posterized the image in Painter IX, and used some color overlays on the kiwi and the yellow sign. Now I have a little souvenir of my one-day Manhattan get-away. I did this sketch with my PDA (handheld computer) using Pocket Artist software. 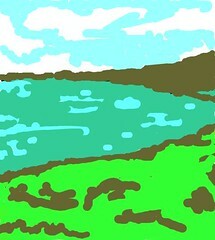 The image was inspired by views of Niantic Bay, Connecticut, which were whizzing past because I made this drawing from a moving train. I was taking the train from Boston to New York for a quick visit to family. A fellow passenger kindly identified the name of the bay. The trip down to New York took place was yesterday so I am back-dating this post as July 16th which is when I did the sketch. I returned today (July 17th) which is when I actually posted it. Although I did just a little bit of cleanup on this image before posting it, the image was created entirely on my handheld computer. I am teaching a beginning drawing class at Red Brick, and tonight was the second session. When the students are doing an exercise or drawing, I try to do it too, whenever possible. Tonight I set up a still life of three nectarines on a plate. 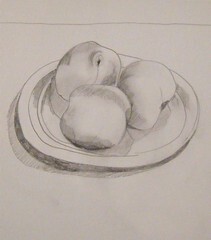 I started this drawing by following the contours of the fruit and the plate, paying attention to the negative shapes. Then I added shadows and shading. This exercise was fun, but it made me hungry! Tonight I used Painter IX to posterize this photo, which I took back in 2005 with my late great phonecam (that made soft focus images). I posted the original photo here back in 2005, but I thought this would be a good time to revisit the image. Raspberries are ripening now, and just as in 2005, they are growing all over everything. I am cutting them back some. (Well I have to, because the thorns on those things are murder!) But over time, I have learned to cut back less and pick more. 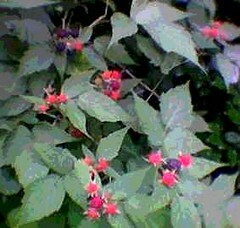 Confronted with raspberries, you can focus on the brambles and thorns, or consider the beautiful little berries. If you want the raspberries, you have to put up with the thorns. So out I go to trim a little and pick as much as I can. I usually get only a few berries at a time, enough for cereal or waffles. It is a funny little harvest. The tiny berries are few and far between, but it is best to make the most of whatever is beautiful, whatever is sweet, however much of it you can find. This is a photo of my collage and decoupage project as it looked the last time I worked on it, which was last Thursday, July 10th. 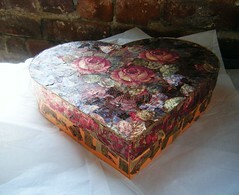 I am recycling the heart-shaped box, which originally contained a Mother's Day gift from my daughter. 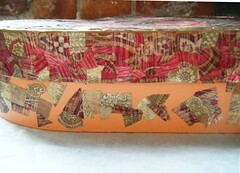 I am covering all the surfaces of the box with designs made with decoupage and collage, using printed metallic ribbons. I have been concentrating on the edge of the box top (covered with a predominantly red pattern). It is almost complete, except for a bit of patching, as can be seen in this photo. But the gold pattern below, on the outside of the box, still has a long way to go. To be continued. . . .
Last week there was a bad wind storm with hail, and a tree came down in the yard. It is fun to garden, but not so much fun to deal with tree removal and getting rid of the debris. 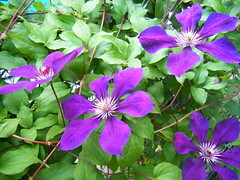 But the other morning, I took a little break to notice that the clematis had opened. I took a few photos with my digital camera because the blossoms looked so beautiful in the morning light. This is the best of the three photos I took. In fact, this is the image exactly as it came out of the camera. I didn't adjust anything and didn't even have to crop it. The aqua peeking through the leaves at the upper left corner is a glimpse of swimming pool, and I considered cropping it out, but I like the combination of colors, and I think the strong color in that corner helps balance the composition. I am continuing to work on this project whenever I get a chance. 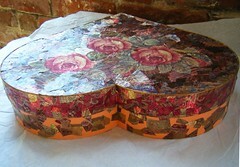 I am covering this heart-shaped box with collage and decoupage patterns made from printed metallic ribbons. The box itself once held a Mother's Day gift from my daughter, and I am going to give her this project when it is finished. This is how the box looked as of July 5th. 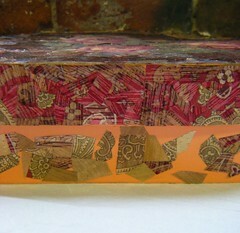 In this closeup of the side of the box, you can see the tiny collage compositions that I am making from pieces of ribbon. Last weekend included a visit to a wonderful garden store in Marblehead, Massachusetts. The plants are outside in rows of beautiful displays and you can wander around through the flower carts and hanging plants. It's a great place for gardeners, but also for photographers. 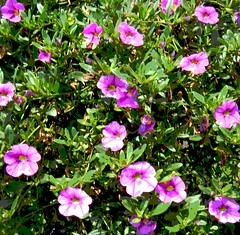 This image began as a photo of a hanging basket of pink petunias. Tonight I cropped the image to get a closer view of the flowers. I liked the pattern of flowers and foliage, so I posterized it using Painter IX. We have had a string of hot summer days here in the Boston area. Here is an image to cool things off a bit. 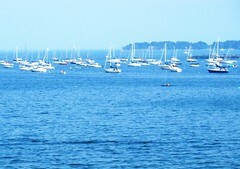 Even when the air is hot and muggy in Beverly, it is almost always better near the shore. I took this photo from a tiny park off a residential street near the ocean, and tonight I cropped the image to get this composition. Beverly has several half-hidden parks where residential side streets run up to the shoreline. These little pocket parks are marked with signs saying "Please Enjoy This Public Way." And I do! They have flowers, park benches, and even steep staircases down to the water. Best of all, they have cool breezes and great views of the ocean. I am teaching a basic drawing class at Red Brick Studio and tonight was the first of four sessions. Because it is a small class, I am trying to participate in (or at least demonstrate) as many of the drawing exercises as possible. That makes it more fun for me, and also helps me to understand what is and is not working in an assignment. One of the first exercises for the class was to create a composition using a repeated shape filled with three different textures. This is my demo. 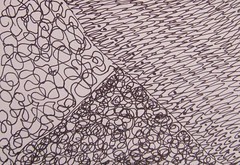 This small drawing (maybe 3 by 4 inches) is done with a fine tip Sharpie pen on sketchpad paper. Here is how the heart shaped box looked as of July 1. 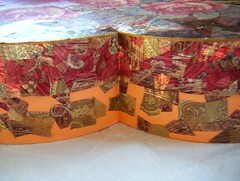 I am covering this box with collage and decoupage, using printed metallic ribbons. (The box itself originally held a gift from my daughter for Mother's Day.) This view shows the progress on the side of the box top (red pattern), which I have been trying to finish, while at the same time working on the gold pattern (on the side of the bottom of the box). Recently I have been exploring a new neighborhood to walk in here in Beverly. There are lots of hills and rocky outcroppings, contrasting with beautiful old homes and gardens on winding streets. 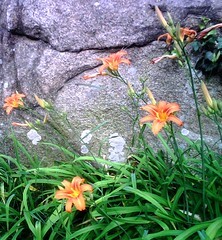 I loved the way the tiger lilies looked against the boulders, so I took a photo with my Blackberry (phonecam). Tonight I cropped the photo to get the composition I wanted, and here it is. This is a work in progress, a collage made out of pieces of cloth, applied to the background by using a sticky backing and ironing the pieces on. I started this piece in the fiber arts class at Red Brick (see post for June 27th). Since then, I have been thinking about what to do with the background. I haven't had a chance to buy more of the sticky backing or get more fabric, so for the moment, I am working with the leftover scraps from the class. Yesterday I finally had a chance to try out my ideas, so I got out my scissors and the iron and went to work. 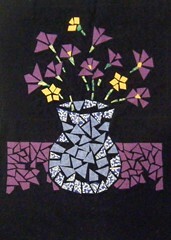 I created a surface to hold the vase, using the same purple pattern as in the flowers. I am almost out of that pattern, so will have to come up with a solution for the foreground. Right now I am considering using some darker material (deep blue or purple) to create shadows and the side of the table. To be continued. . . . I took this photo tonight at Independence Park in Beverly, Massachusetts, a great place to watch fireworks. This is a beachfront park, and fireworks from at least three nearby towns can be seen: Salem, Marblehead, and Beverly Farms. Because of the distance, the sounds are muted, but the water reflects and enhances the visual effects. In addition, there are lights along the shore, and even on the water because some people watch the fireworks from their boats. 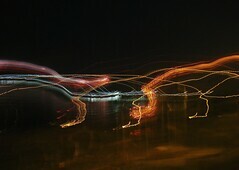 I took my new digital camera along, thinking I would try to get some pictures. My camera has a setting for fireworks. Well, I loved the fireworks, but was disappointed with most of the photos I took, and none of them do the scene justice. For one thing, it took me a while to figure out that this was a slow shutter speed, so to get a clear picture, the camera has to be held very still. So I got a lot of mistakes. But a few of the mistakes were interesting, and this is one of the best! I adjusted the contrast to enhance the bright lights, and cropped this image to get the composition I wanted. Although last week was really hectic, I did manage to slip away for an hour here and there to work on this project. 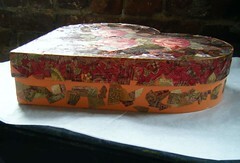 This is a keepsake box that I am covering with collage and decoupage made of printed metallic ribbons. I received the box several years ago. It held a Mother's Day present from my daughter, and when this project is finished, I am going to give the keepsake box to her as a gift. A few days ago, I posted a closeup view from the side. But this photo, taken a few days later, shows more of the box. I have been concentrating on the outside of the box top (predominantly red ribbon) and the outside of the bottom of the box (predominantly gold ribbon). I am further along with the red pattern than with the gold, but I am seeing progress. There is a lot of detail work to this project, but I am really enjoying it, and have to force myself to stop working. To be continued. . . .
Today I was asked to take a picture of the inside of our (malfunctioning) swimming pool filter, to e-mail to the swimming pool company for a diagnosis. After launching into my customary rant about "The Role of the Artist in American Society," I complied, using my digital camera. Although it was hard to see what I was doing, I did my best, and the results were very useful to the swimming pool people. But family members who saw the photos thought they were interesting, and I had to agree, even though at first I laughed off the suggestion that I post them here. So tonight I cropped one of the photos and posterized it, and here it is, a piece of found art (with apologies to Marcel Duchamp). This is funny, but also serious, because I really do believe that art can be found anywhere (even in a broken swimming pool filter), and that beauty can be found every day, if we are willing to look. 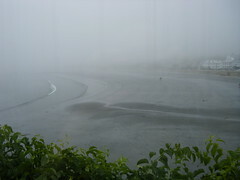 I took this photo of the beach at Swampscott, MA, from inside the Red Rock Bistro during brunch last Sunday. Tonight I cropped the photo to get the composition I wanted. One of this restaurant's many attractions is its view of the Boston skyline, but it was much too foggy Sunday morning to have any hopes of seeing that. But that doesn't mean there was nothing to see! I think fog is visually interesting because it calls attention to details that are often overlooked. I loved watching the waves come up onto the beach. In this photo, I was trying to capture the way the curve of the ocean waves mirrors the line of the shore, seen in the houses on the curving road on the right.